I’ve found that each technique has it’s own strengths and weaknesses, and thus I’ve taken bits and pieces from each and created my own system that works for me. First off, I really like the idea of Anthony Robbins "Results First" paradigm, where a person first creates "Categories of Constant Improvement". A "Category of Constant Improvement" is an area of your life that you want to improve. Generally, categories are divided between Personal and Professional categories, but are not necessarily limited to that. Entrepreneurs with several businesses may want categories for each business that they manage. However I will stick only with personal categories for this article for simplicity. Once you have your categories, you use the acronym RPM for Results, Purpose, and MAP (Another acronym for Massive Action Plan). I use Evernote to store my categories and the corresponding results, purpose and MAP. Evernote gives me the capability to sync these plans across all my computers and most devices. I really like RPM for initial planning. However, in the midst of your day when new tasks are flying at you and new ideas coming out, rarely do you take each task and put it into the corresponding category. Here is where GTD comes into play for me. While both GTD and RPM have their own products, I prefer to use the free online service Remember The Milk with the Google Chrome browser and the Google Extension A Bit Better RTM . 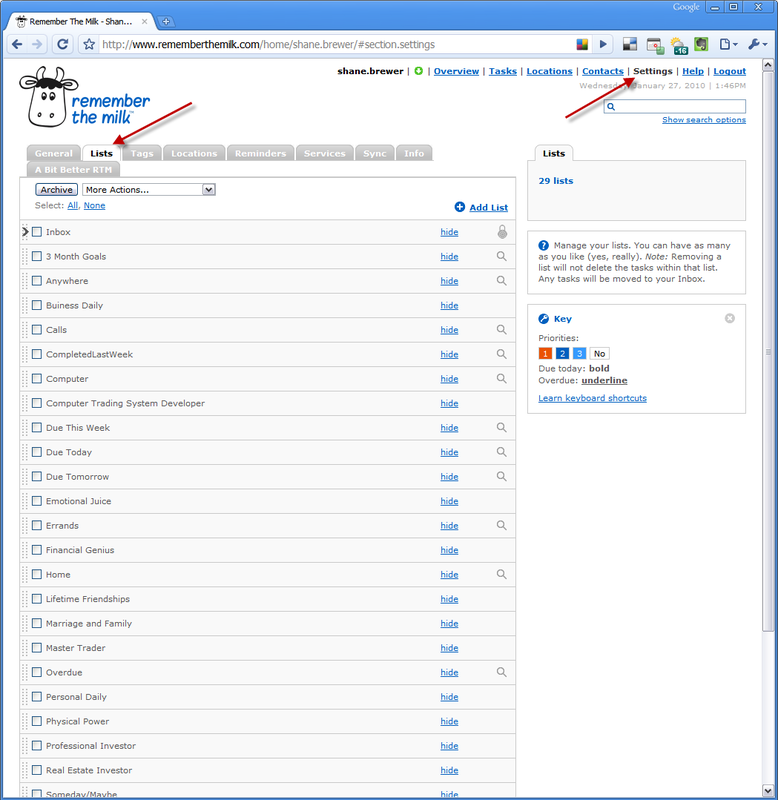 I like to use Remember The Milk (RTM) because I can have all my tasks in 1 place so long as I have an internet connection, without having to sync across all the different computers and devices that I use. When new ideas and task fly at me during the day, I use RTM various input methods to store these ideas and get them out of my brain and thus reduces my stress level. I prefer to use RTM’s web site for inputting new ideas, but you can also email new tasks to your list, or use the Iphone or Android apps to add tasks on your phone (Requires a Pro account for $25/year). Then when I am going through my day, I may want to knock off all my phone calls, which may cross-cut several different categories. But with Calls tag, I can just search for all my calls, and complete them one after the other. So… how do you set up RTM to utilize this system? 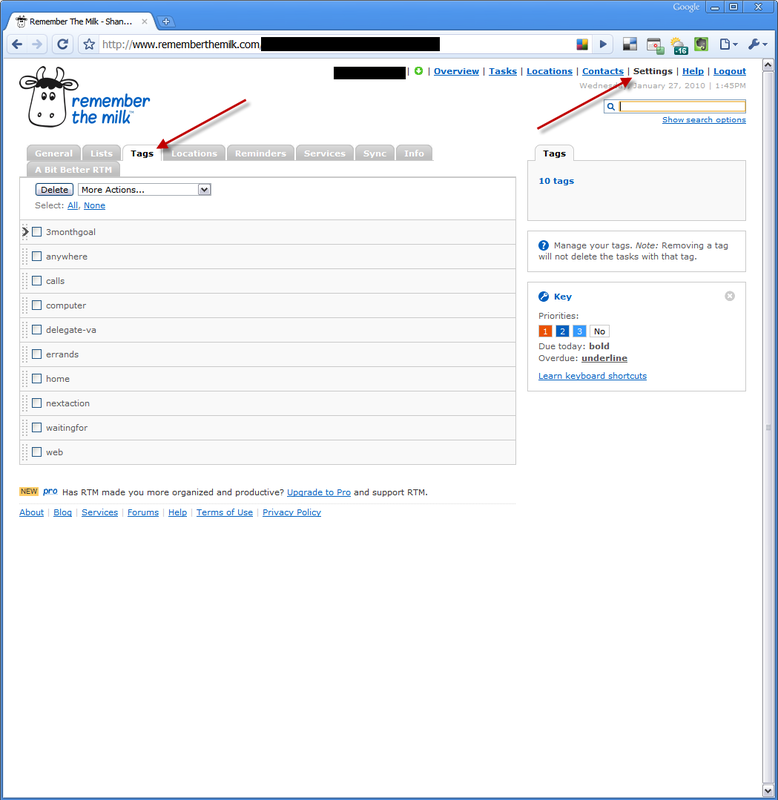 To set up Remember The Milk, first create a list for each Category of Constant Improvement by clicking “Settings” from the main page, and then clicking the “Lists” tab. Next, set up your GTD tags but clicking the “Tags” tab. Next add a tag for each GTD tag that you want to have. Finally, as stated in “The 4-Hour Work Week” by Timothy Ferriss, I like to set shorter term goals (3 months) to keep me focused and to put Parkinson’s Law into effect (A task will swell in perceived importance and complexity in relation to the time allotted for its completion). To do this, in each category I will create a task prefixed with “3 MONTH GOAL” and then tagged with “3monthgoal”. This makes my goals stand out from my normal tasks and also allows me to create a smartlist to view all my 3 Month Goals at a glance. That’s it! Now you have a functioning RPM/GTD/4HWW hybrid time management system! Let me know what you think and especially if you have any tips or advice; I am ALWAYS looking to refine things and make things easier/faster/more fun. Most of all, tweak your time management system to the way you like it. My system works for me but it is important for you to play around with yours to figure out what works for you. But hopefully this may give you some ideas and/or a place to start developing your system. Curious how you handle one off discrete “operational” style projects that don’t really fit into an area of improvement? Good question! I have found that all of my projects fit into at least one of my categories of improvement. However, I have found that certain tasks do not (Change my car’s headlights, Pickup milk, etc). For these tasks, I have 2 lists named “Personal Daily” and “Professional Daily” for these tasks. And if it’s a project, you could just create a list for the project that doesn’t fit into your categories. Hey man, this is real good stuff. How is it working for you? I’m implementing a similar system combining RPM (OPA) and GTD in Evernote. What do you do with finished items? This continues to work for me… however I continue to tune it to meet my changing world and objectives. I plan on writing an update to this article soon to discuss the changes I’ve made. I personally like to keep my finished tasks stored away so I can come back to it at a later to date to see everything that I’ve done towards a goal. It’s also helpful to examine and look at where you might be able to improve in the future. To implement this in Evernote, all you would have to do would be to have a separate notebook that you would move completed tasks and projects into once finished. 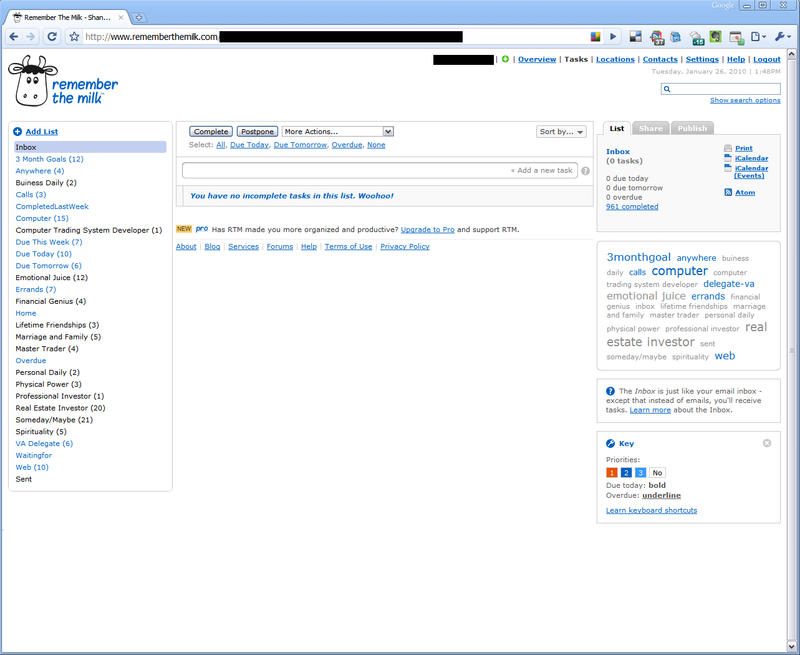 But I don’t use Evernote for task management these days… I prefer to use a more specialized task management application. How do you manage your Evernote? One notebook per category? if so how often to you add or edit your notes within a given category? This is my new favorite blog post ever. I am setting this up! I had tried RPM a while ago only to be overwhelmed by its “top-heaviness”. I love how you’ve trimmed it down to what works for you and that you are very specific as to how you manage it all. Awesome. Thank you!